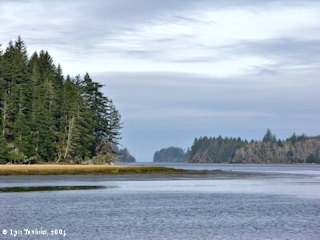 Click image to enlarge Long Island Slough, Willapa Bay, looking north from National Wildlife Refuge boat ramp. Long Island is on the left, looking up the slough. Image taken November 9, 2005. Willapa Bay is a large shallow bay 25 miles long and 8 miles wide, located along the Pacific Ocean north and east of Long Beach, Washington. 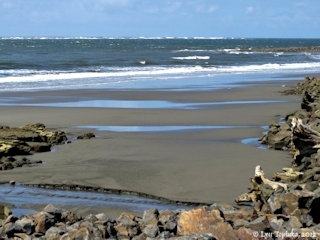 The small Washington communities of North Cove and Tokeland lie along the northern entrance to the Bay, and Leadbetter Point on the Long Beach Peninsula forms the southern entrance to the Bay. 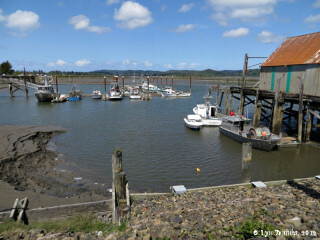 Major tributaries to Willapa Bay include the Willapa River on the northeast and the Naselle River on the south. In the early 1800s the British Hudsons Bay Company used the Wallacut River as a portage between the Columbia River and Willapa Bay. 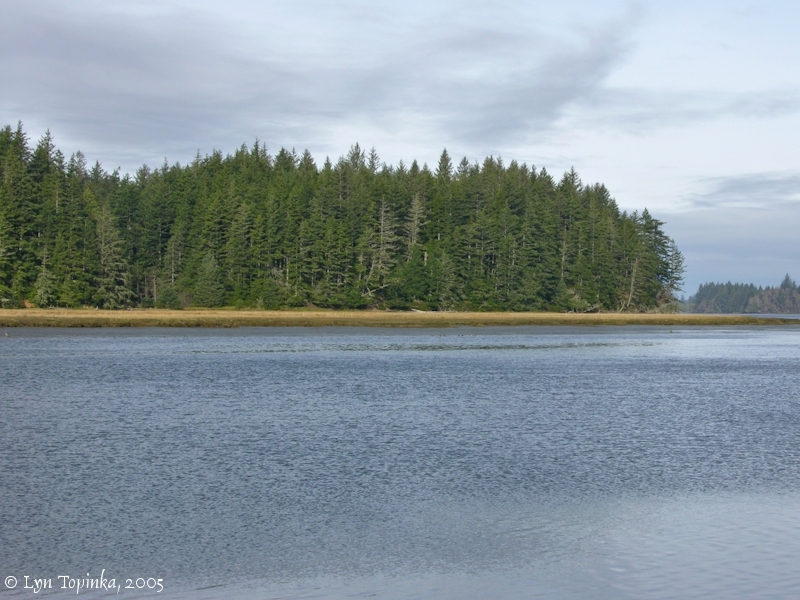 Today a large part of Willapa Bay is located within the Willapa National Wildlife Refuge. 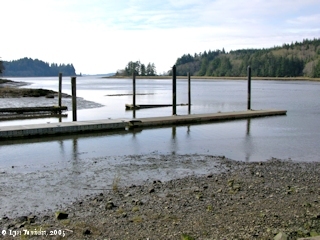 Willapa Bay was once known as "Shoalwater Bay", and occasionally seen spelled "Showalter Bay". According to Hitchman in Place Names of Washington (1985), Willapa Bay had many early names. "... 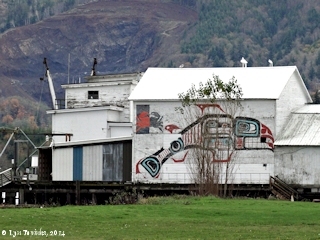 The original Indian name was Atsmitl a Chehalis tribal designation. In the period of Spanish exploration, it was charted as Ensenada de Mal Arrimo by Jose Martinez de Zayas. Early settlers and oyster harvesters used the name South Bay, as suggested by James Swan. On July 5, 1788, Capt. John Meares, a British fur trader, named it, very appropriately, Shoalwater Bay. Dislike of that name resulted in a switch to the present name, which is for the Whilapa Indian tribe, which lived around the bay when the first white explorers arrived. ..."
In 1960 (and 1941 ???) 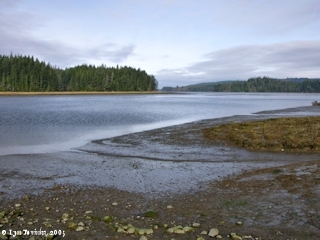 the U.S. Board of Geographic Names made official "Willapa Bay". Lewis and Clark never saw Willapa Bay, however Captain Clark mentioned the Bay in his "Estimated Distances from Fort Mandan to the Pacific Coast ", written while at Fort Clatsop during the winter of 1805 and 1806, with and Editor's note at bottom of this passage stating "50 miles of the above from the information of Indians". Willapa Bay once supported a thriving oyster business. Long Island, a 7-mile-long island located in the southern middle of Willapa Bay, was named by James G. Swan in 1857. The name is a descriptive name. Long Island is 5,400 acres of dense western hemlock, Sitka spruce, and western red cedar, and is the location of a 274-acre remnant of old growth lowland coastal forest containing red cedars which are over 900 years old. Research on these red cedars helped to date the Cascadia Quake of 1700. "Willapa National Wildlife Refuge is over 16,000 acres of tidelands, temperate rainforest, ocean beaches, and small streams. It also includes several rare remnants of old growth coastal cedar forest. 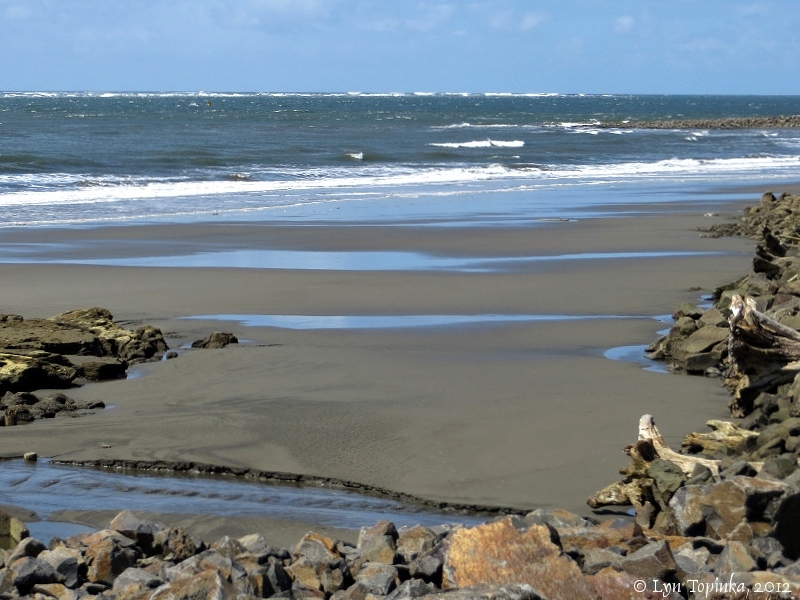 The Refuge preserves habitat for spawning wild salmon, hundreds of thousands of migrating shorebirds, and threatened species such as the snowy plover and marbled murrelet. The Refuge is a great place to see what the Pacific Northwest looked like over 100 years ago. The Refuge is located in southwestern Washington on Willapa Bay, one of the most pristine estuaries in the United States. Willapa Bay is the second largest estuary on the Pacific Coast and includes over 260 square miles of water surface.The Refuge was established in 1937 to protect migrating and wintering populations of brant, waterfowl, shorebirds, and other migratory birds. The Refuge was established at a time when many estuaries were rapidly being destroyed by diking, draining, dredging, sedimentation, and pollution. The Refuge preserves a number of unique ecosystems including diverse salt marshes, rich tideflats, rain-drenched old growth forest, and dynamic coastal dunes. Visitors to the refuge can enjoy viewing a wide variety of wildlife, from spawning salmon in the Refuge's numerous streams, Roosevelt elk on Long Island, and the tens of thousands of migrating shorebirds that crowd the beaches at Leadbetter Point and tidal flats of Willapa Bay." Click image to enlarge Long Island and Long Island Slough, Willapa Bay. Long Island is on the left. View from the boat ramp at the Willapa National Wildlife Refuge Headquarters. Image taken November 9, 2005. Click image to enlarge Long Island, Willapa Bay. View from the boat ramp at the Willapa National Wildlife Refuge Headquarters. Image taken November 9, 2005. 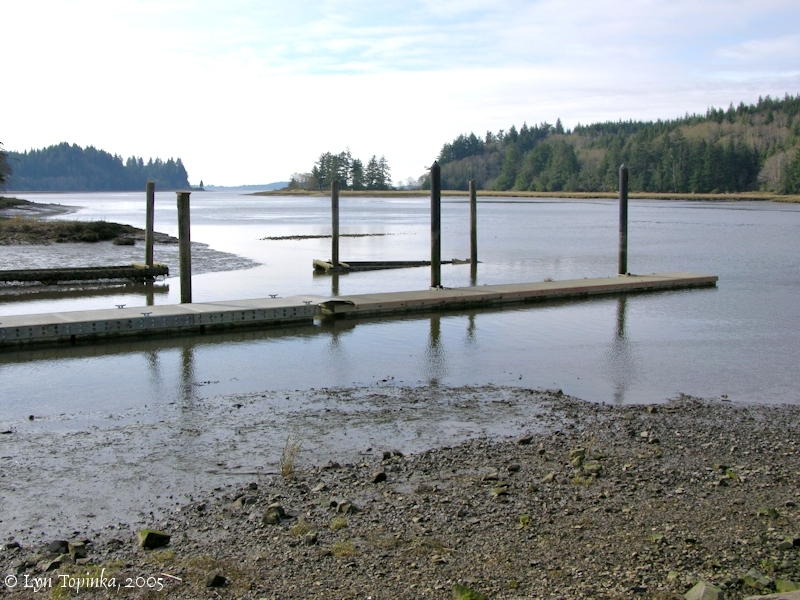 Click image to enlarge Boat ramp, Long Island Slough, Willapa National Wildlife Refuge. Long Island is on the right. Willapa Bay is on the horizon. Image taken November 9, 2005. "... FORT WILLAPA: A stockade built by residents of the Willapa Valley in 1855 when fear of Indian attacks swept the Northwest. The site, now known as Giesy's Crossing on Highway 6, was at the north end of the valley and overlooked the Willapa River. Three small buildings surrounded by a stockade wall (with guard house on top) were built to protect the settlers. The time of fear passed and the fort was never used for defense purposes. For several years afterward it was a community meeting place or housed new families moving into the valley. The stockade was sometimes known as "Fort Giesy" because it was on land taken as Donation Land Claims by the John and Henry Giesy families. Eventually the stockade fell into disrepair and the Giesy family built their home on the site. A post office was established at the fort April 29, 1858, and continued until December 7, 1870, when the office was moved to Woodard's Landing. The tree shaded knoll near the fort site is the gravesite of Willie Keil and members of the Keil Colony and Giesy family. An historical roadside marker on Highway 6 tells the story of possibly the longest burial processional in history. ..."
South Bend and Raymond are two Washington communities located inland on the Willapa River, at approximate River Miles 4 and 7, on the northeast side of Willapa Bay. 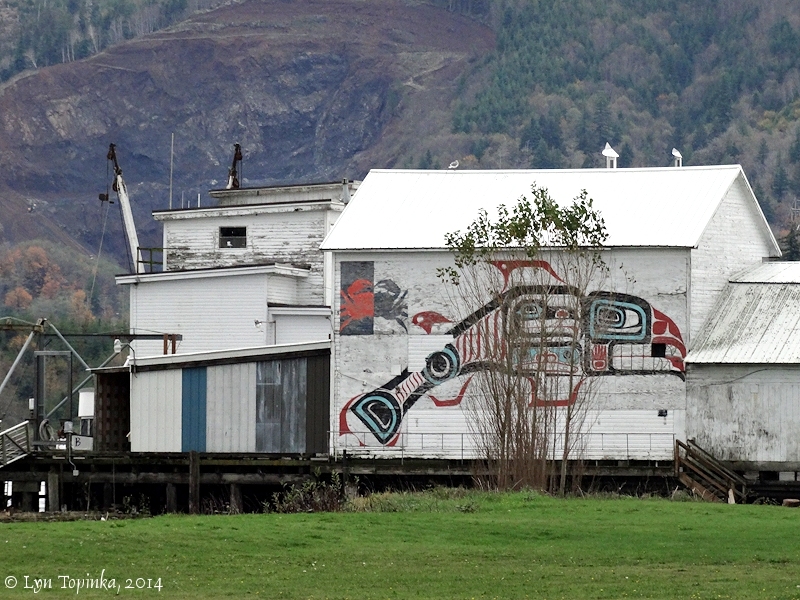 Click image to enlarge South Point Seafood, Willapa River, South Bend, Washington. Image taken November 5, 2014. 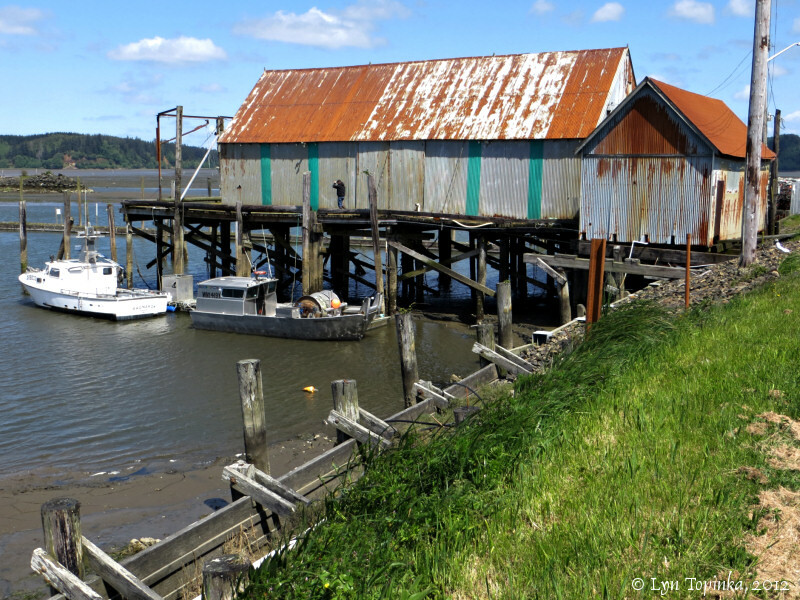 The small communities of Tokeland and North Cove lie at the northern edge Willapa Bay. 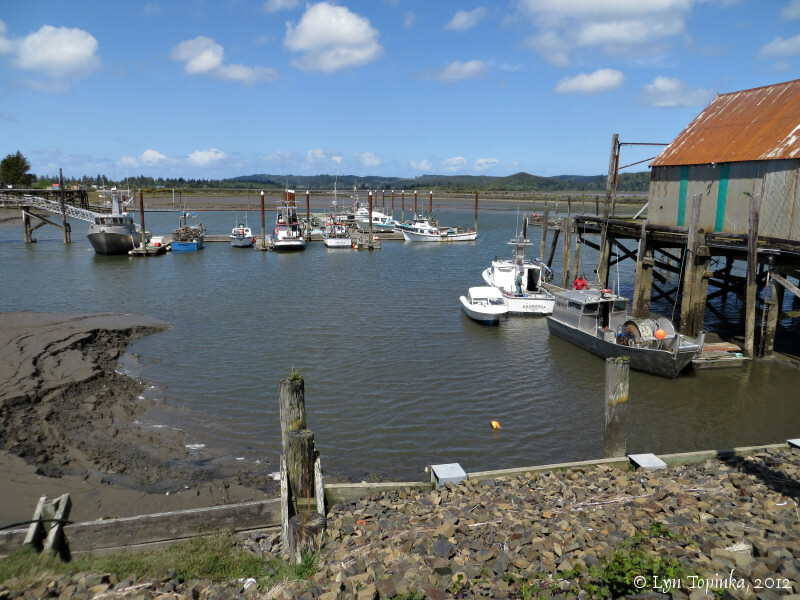 Click image to enlarge Tokeland Marina, Willapa Bay, Washington. The Tokeland peninsula lies on the northern mouth of Willapa Bay. Image taken May 9, 2012. Click image to enlarge Pacific Ocean from North Cove, Willapa Bay, Washington. Image taken May 9, 2012. From Clark's "Estimated Distances from Fort Mandan to the Pacific Coast ", written while at Fort Clatsop. Editor's note at bottom of this passage states "50 miles of the above from the information of Indians".